The site is ‘joinable’, which means that an Oxford user will need to log in, and then elect to join the site. 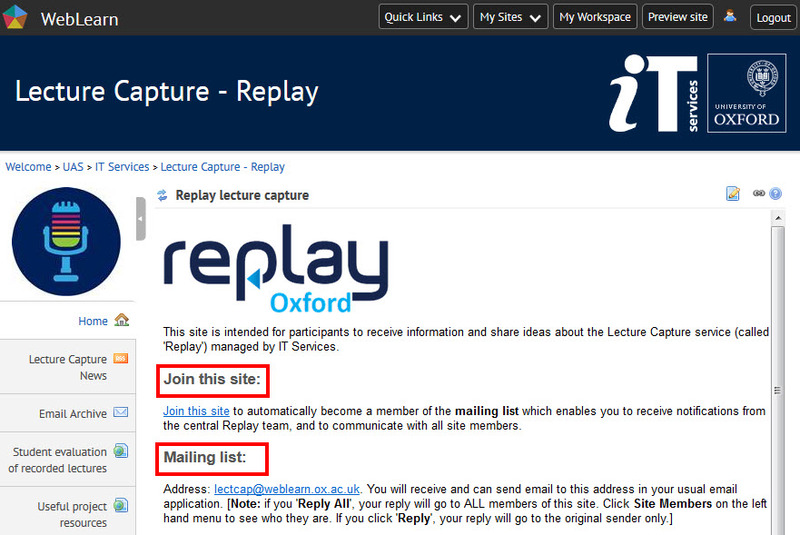 You will then automatically receive emails sent to the site email address, which is lectcap@weblearn.ox.ac.uk. You can also initiate an email to the group by sending it to the same email address. It will go to all the site members on the mailing list (currently 77 people). If you click on Site Members on the left hand tools menu, you will see who the site members are. When you receive an email from the list, clicking on ‘Reply’ will send the reply to the original sender only. If you click ‘Reply All’, the reply will go to all the site members on the mailing list.